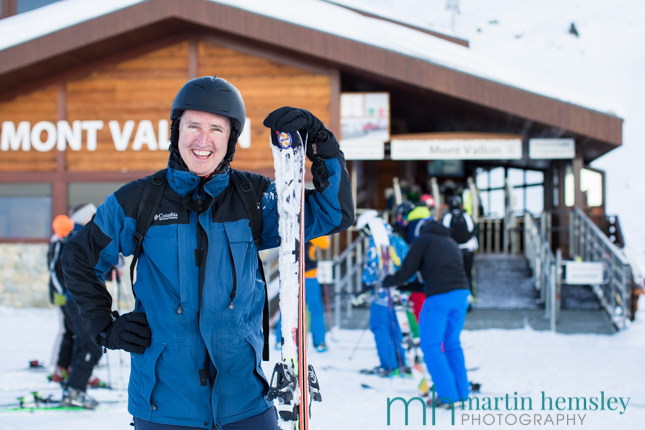 Instead of writing about ski technique, snow conditions, or people I have met whilst ski instructing recently in Méribel, I thought I would shake up the blog posts for a change. 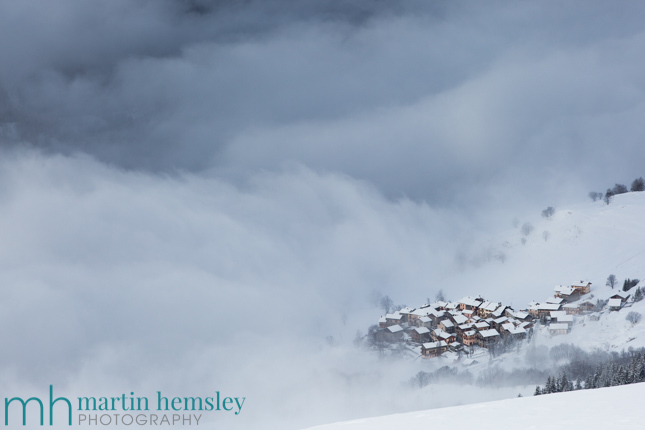 If you are a regular reader you will know that I love to take a photo or two whilst up the mountain. And let's face it, what a wonderful and stunning environment the mountains are. 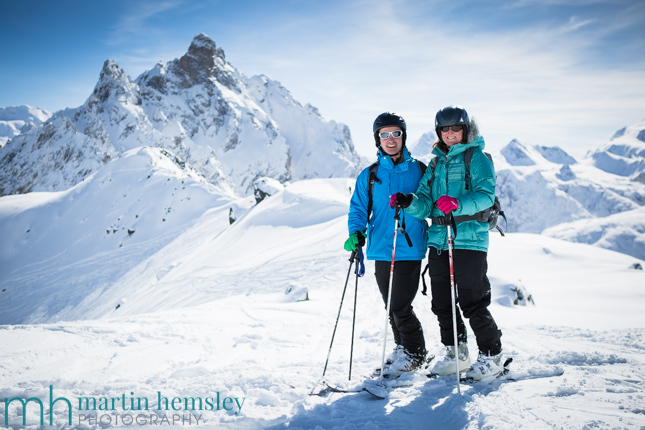 Throw in beautiful snow conditions, glorious weather and happy people on holiday - it's a dead cert that we can all take lovely photos as reminders of the holiday. It's true isn't it? The reality can be very different, it can take some skill and thought to craft a good photo. However all is not lost - there is good news - here is a quick summary of tips to help you take some pics that will do you proud. This compositional rule has been around for centuries and has been used by both artists and photographers ever since a paint brush and camera have existed. The basic premise is this: divide an image into a grid with it's horizontal and vertical planes, into even thirds. 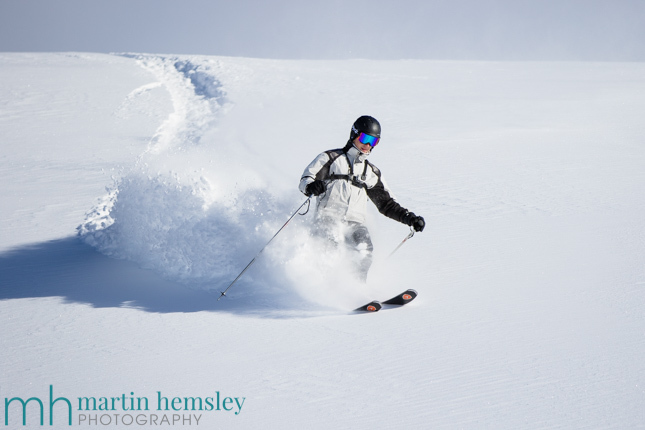 If you look at the photo below, the skier is placed on a vertical line that is one third in from the right of the frame. It is very pleasing on the eye if a subject is lined up on an intersection of a horizontal and vertical line. It doesn't matter if you shoot with a professional DSLR camera, a compact camera, or a smart phone. Composing a picture using the rule of thirds method will always produce a lovely image. When a photo is admired, quite often this will be due the rule of thirds. Another example (below) was taken just before stopping for a hot chocolate. Yes the lighting is helpful, but the snow blower has been positioned on the intersection of the lower horizontal third, and the far right vertical third. It sounds more technical and theoretical than it actually is. Just take out your camera and have a play, and you will see it work well in reality. However, like most compositional rules, they can be broken if you feel like being a rebel. In theory, subject matter in the middle of an image may not look that interesting. The image below contradicts this I believe. 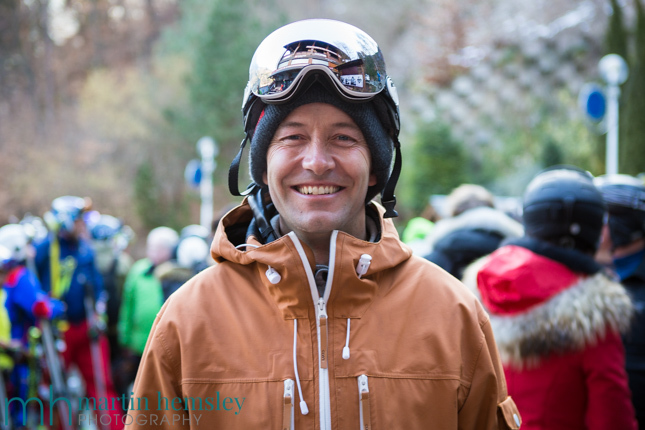 I took this photo of Ed Leigh, one of the presenters on the Ski Sunday TV program, last winter. I think it has impact, even though he isn't placed on an intersection in the rule of thirds grid. The latest trend for video and camera footage is the use of drones. The high viewpoint we get from these amazing tools are so different to our everyday life, we are fascinated by unusual viewpoints. 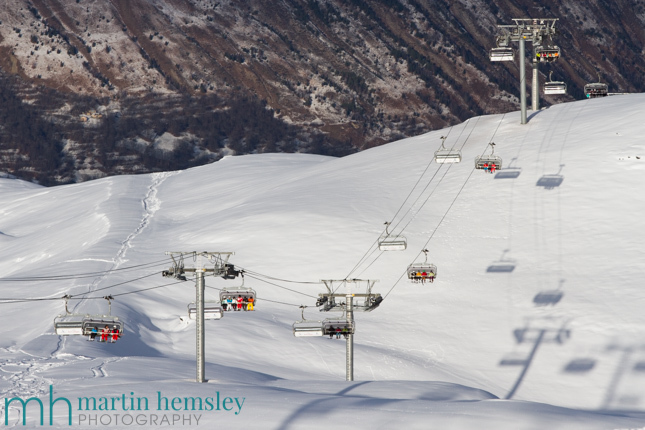 As skiers, we have had a similar version of this for decades - chairlifts. 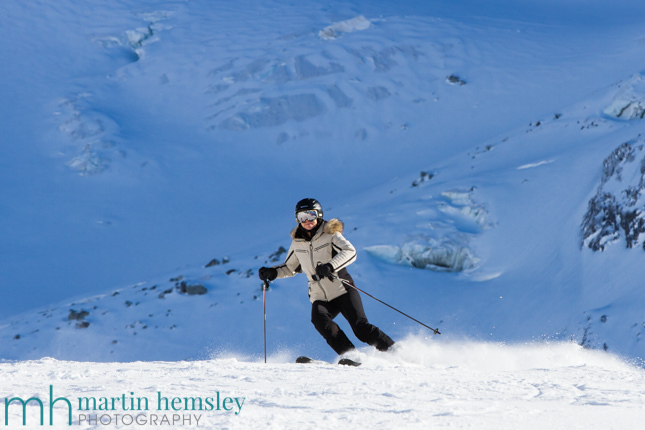 I took these two photos whilst sat on chairlifts, in-between going for a ski. How cool is that? 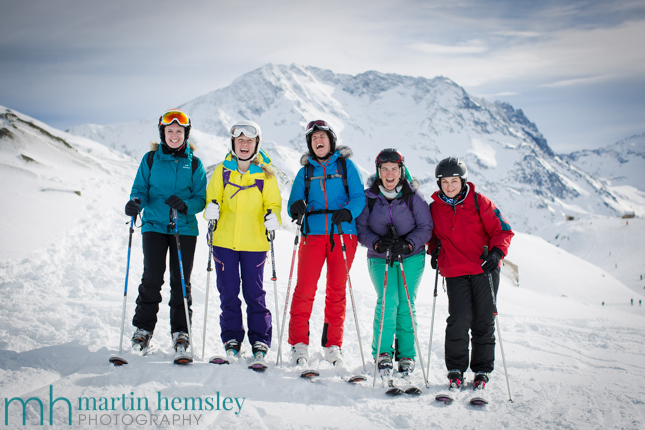 No waiting on the pistes for a photo to be taken, losing precious skiing time. Granted you can get cold hands sometimes taking pics, but the different viewpoint can produce nice images. Through gaining experience, I've noticed that sitting on a far side of a chairlift can help out with avoiding people's arms, heads and other general clutter. 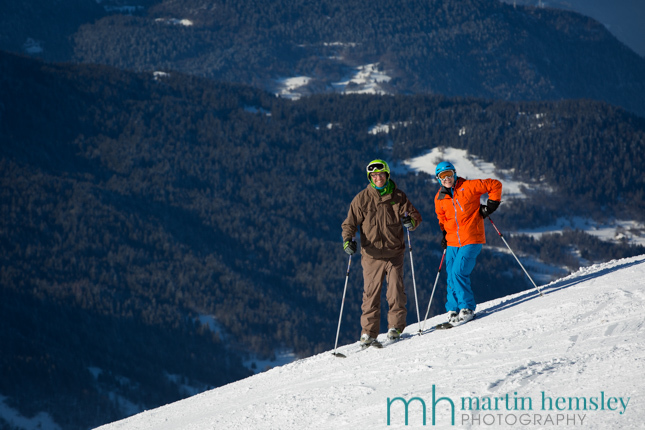 Another tip that you can use is be aware of people's skis blocking the view when pointing the camera down. It can be tricky because the chairlift is constantly moving, but with practise it can be great fun. If you shoot with a smart phone, even though the technology companies harp on about how good their kit is, this can be a challenge. However if you use a compact camera, or better still a DSLR camera body, you have a much better chance of success. You might have a shooting mode called sport, or action. If so switch your dial to this. Or if you can opt for a mode that controls shutter speed, then choose a shutter speed no lower the 1/500th of a second, preferably higher to make sure of success. 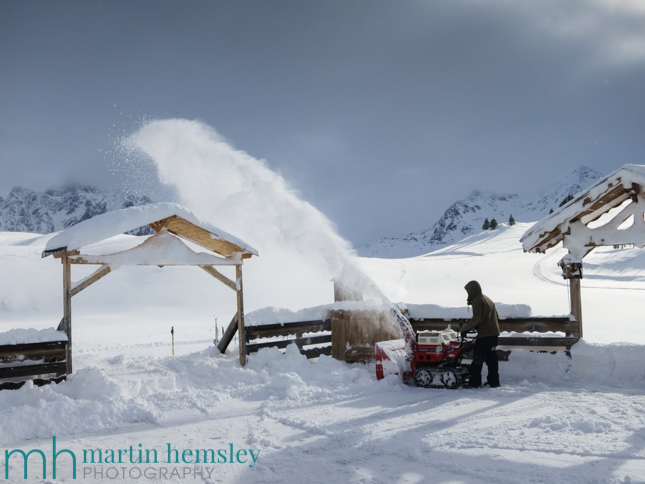 This shutter speed will give you a good chance of freezing the action in front of camera. Another tip is to check in your manual what auto focusing options you have available. Many cameras have different focusing choices. The most common is for a camera to focus on a subject, and stay fixed at that set distance. 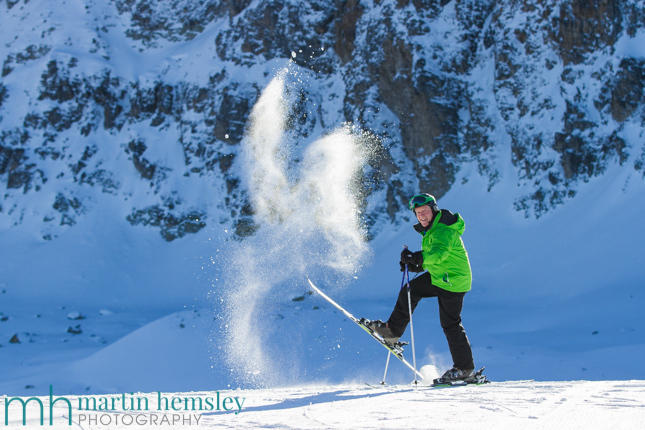 However a skier is constantly moving. So if you have a focus option that can lock focus onto a subject that then moves, but the focus tracks the subject - then you have even more chance of success. To be honest, this can be the trickiest skill to master irrespective of what camera kit you have. But it can also be the most rewarding if successful. This may sound a little odd, but compared to focus tracking it's dead simple. The vast majority of cameras/smart phones allow you to zoom into subjects. If you can place yourself in a position where you have your main subject in front of a mountain far behind, you can get a dramatic effect. Quite often people take photos of mountains which look flat. Using a zoom lens to squash a composition can give greater impact. Here I composed the two guys (rule of thirds again), using a zoom lens and avoided any sky, to give a more dramatic affect. If you can position yourself higher than the subject, with a mountain in the background, than you are good to go. DSLR, compact camera or smart phone, it all works. Lighting can make or break a photo, even if you compose an image beautifully. If the main subject in an image is a person or people, it's very important to see where the main light source is coming from. 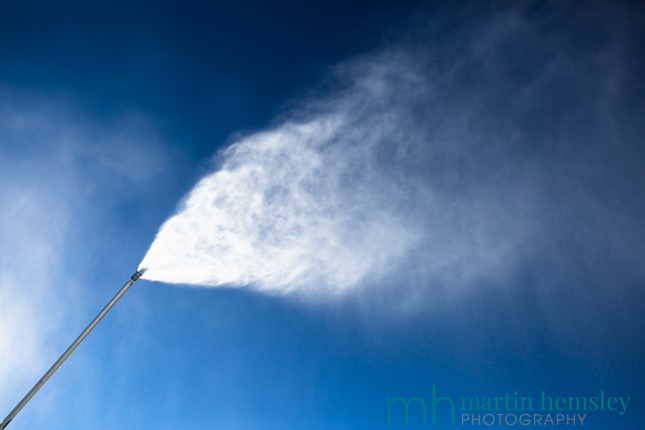 For us skiers on the mountain, the main light source is normally the sun. If the direction of the light source is from the side, and goes across the face, you will notice horrbile shadows. But don't worry, all is not lost, there's an easy fix. Either turn the subject by about 90 degrees, or you as the photographer can move your feet, to enable better light to fall on the subject. It really can be that quick. One of the most effective lighting options is to have the light source, ie sun, coming from behind the subject. This is called back lighting. The photograph above uses this beautifully. I noticed that Chris was stood in front of a dark background and he was backlit. The light really makes this image. One thing you need to be careful of when shooting backlit subjects is that they can easily become a silhouette. If this happens, making the subject larger in the image can make the camera's sensor concentrate more on the exposure of the subject. If you have a camera that enables you to make adjustments with 'exposure compensation', increasing the exposure by about 2/3rds to one full stop should be spot on. Smart phones have a little wriggle room with adjusting the exposure, but will have some limitations. 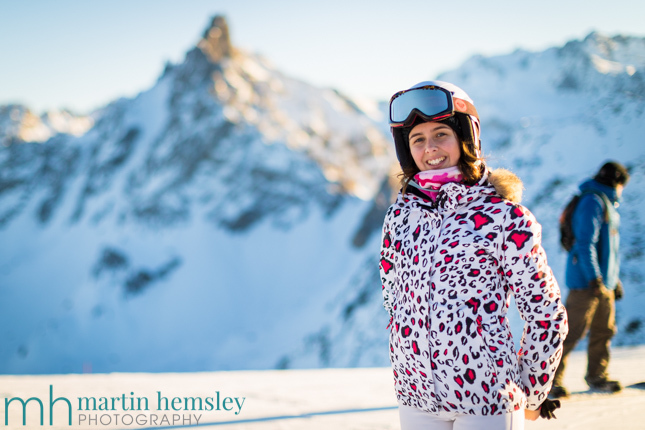 The photo below of Aine, for my 'Humans of Méribel' project on Facebook, was taken just over a week ago. Aine is beautifully backlit by the late afternoon sun, as is the mountain peak behind her. I composed the frame using the rule of thirds method. I love this image, and I believe it is the quality of the light that makes it. Late afternoon sun can be stunning, look out for it the next time you are on the mountain, especially at this stage of the winter before the days get longer. Placing your subjects with the light coming in from the opposite direction, ie from the front, can also work well. Especially if the background is dark. But be aware that the sun, or other light source, might make people squint. Sometimes having something in the background can really enhance a nice shot, especially if it gives context. This is a subjective thing of course, what might work for me may not work for others. But I guess you could say that about photography anyway! I quite like this image of Phil, taken last winter. Rule of thirds again, nice even lighting, and I really love his expression. I believe the background helps the image as well, it places the viewer to the location. 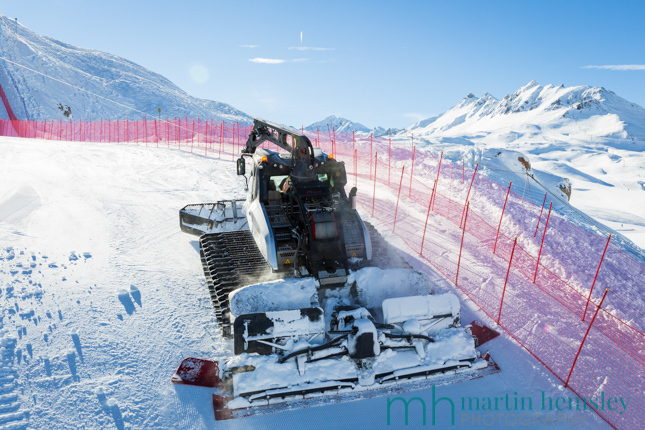 And if you have skied in Méribel before, you might recognise the Mont Vallon lift. The roof of the building nicely frames Phil as well. 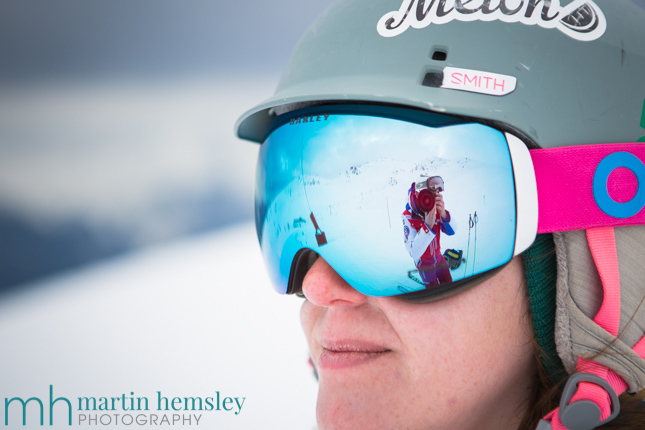 The photo below is another of my favourites from the 'Humans of Méribel' project. The lighting is gorgeous, but for me it's the background that gives the image plenty of impact. 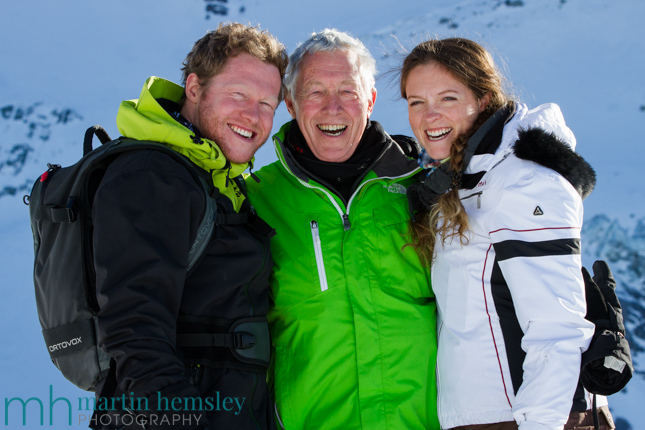 The image below was taken quickly whilst I was teaching Gilly and John last winter during half term. It's a hidden gully that very few people know about because it's out of sight. 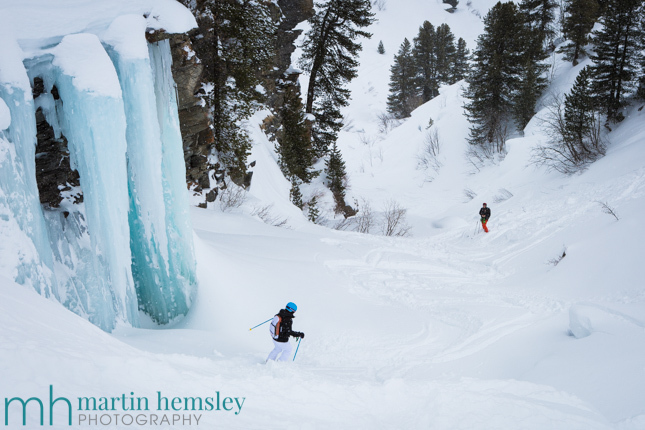 We call it the Wallace and Gromit gully, because you end up with a Wallace and Gromit style smile when skiing through there. I wish I could tell you what I said to get this reation, but I'm sure you've heard the phrase - "What goes on tour, stays on tour"! This can be really fun. This is a very creative tool, and you can use anything that reflects. Mountain restaurant windows, glass tables, glass fronted picture frames, sun glasses, and for me the best are ski goggles. The next time you are on a chairlift, check out the reflection of ski goggles of the person sat next to you. This is an invitation for you to think outside of the box, and give your creativity a boost. Have fun with your photography, learn from any mistakes. Try and remember the style of photography that you've seen and enjoy when flicking through magazines and websites. If you take shots that don't work, before pressing the delete button try to figure out why the image doesn't work. This is one of the best ways of learning and improving. It can be a real buzz taking photos. Quite often I will get excited about certain images that I've taken, but my wife won't understand why I am so stoked. This is common with many other photographers I'm friends with, we all have our own personal style. I'd like to finish off with one final image, of a bouquetin. Towards the end of last ski season I took some time off snow, and visited the Vanoise National Park not far from here in Méribel. I timed the visit to be late afternoon and early evening because the light was going to be at its best then. Without boring you with my afternoon, I captured this gorgeous young bouquetin. There are many reasons why I love this, but let's break it down briefly. Rule of thirds was used again, the intersection of the lower horizontal third, and the far right vertical third. 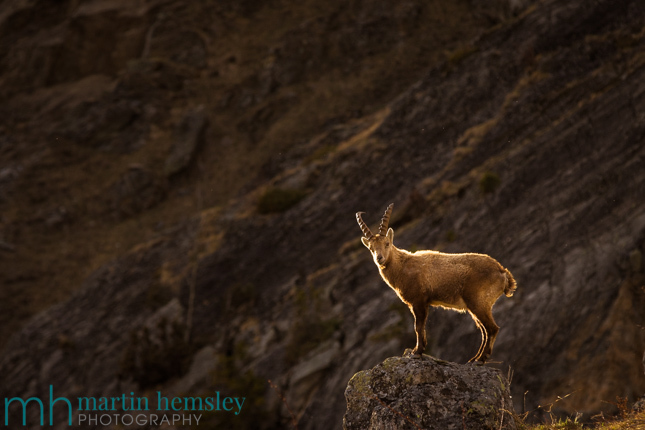 The bouquetin is exquisitely backlit with warm sun, seconds before it dropped behind the mountain ridge. The background is clean and uncluttered. To say I was doing imaginary back flips all the way home that evening would be an understatement. 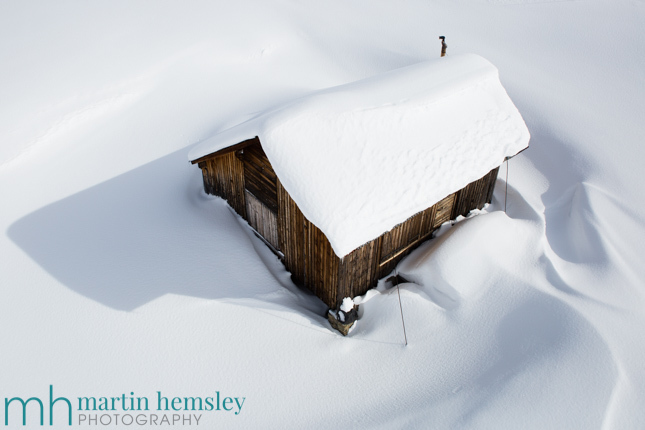 I've had this image printed and framed, and it is now hanging up in our apartment here in Méribel. 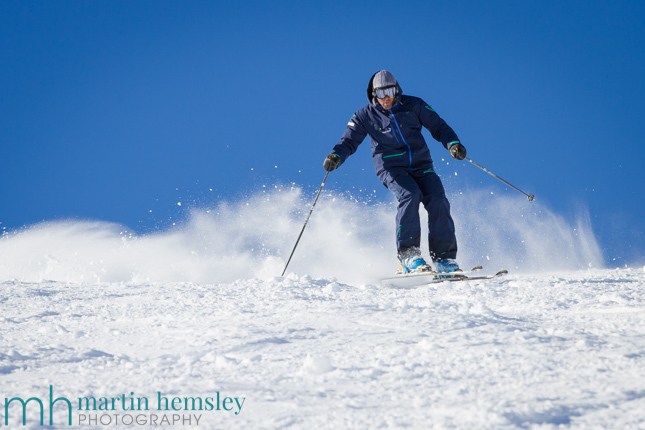 So there you go, probably my biggest ever blog post, combining my two passions and careers of ski instructing and photography. I hope you enjoyed it and will find it useful the next time you come skiing. 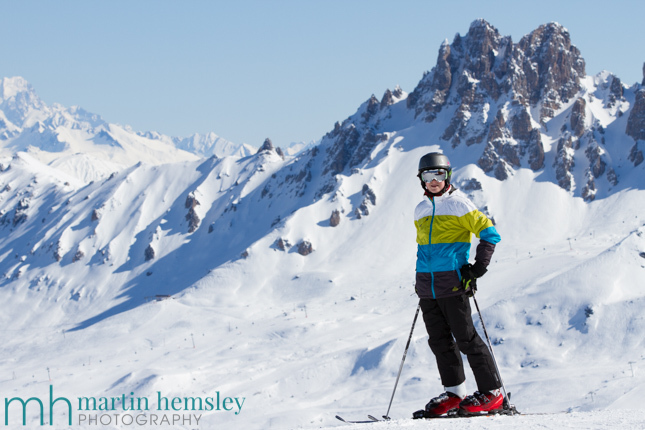 If you would like to read about improving your skiing performance, click here for a link to an article I wrote a few months ago. Feel free to share away on Facebook, Twitter, Google+ etc, or leave a comment below, it's always fun hearing from you. Martin.